Henry Darrow, Charles Durning, Joel Fabiani et al. 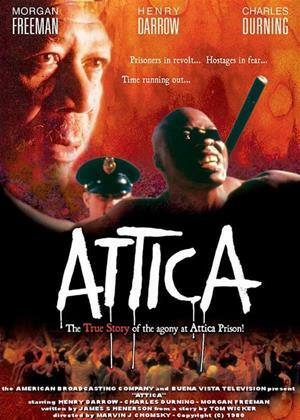 Attica is a probing, no-nonsense TV-movie re-creation of the tragic events which followed the Attica (New York) Correctional Facility rebellion of September 9, 1971. Inmates demanding better food and living conditions used jerry-built weapons to take 38 guards as hostage. Negotiations begin immediately, only to continually break down thanks to uncompromising stubbornness on both sides. Four days into the crisis, the rebellion ends in a bloodbath, with state troopers firing on the prisoners - killing several of the guards in the process. Based on the eyewitness reporting of the New York Times' Tom Wicker (here played by George Grizzard), who was one of the civilian negotiators during the stalemate, Attica was first telecast on March 3, 1980. (Perhaps significantly, Governor Nelson Rockefeller, whom many hold responsible for the climactic carnage at the prison, is never seen in either factual or fictional form during the film).